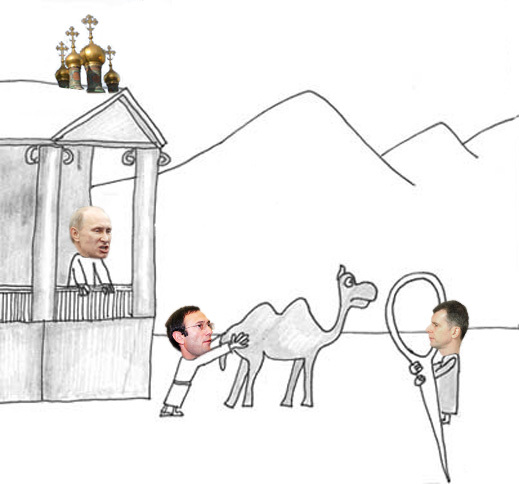 FORGET THE CAMEL AND THE NEEDLE, IS THE KREMLIN LEAVING OPEN THE BACKDOOR FOR DEPUTY PRIME MINISTER SHUVALOV, SENATOR KERIMOV? After the ancient Jewish preachers spoke of improbability as elephants trying to navigate needles, the Christians slimmed down to camels. But there was also the post-gospel interpretation that what Jesus actually meant, in that piece of advice to a nervous rich man, was a gate in Old Jerusalem, which opened after the main gate was shut at night. A camel could only pass through this smaller gate if it stooped and had its baggage removed. A lot of camel bones have been excavated around Jerusalem, but the small gate hasn’t turned up yet. By contrast, there are plenty of small gates in the Kremlin wall, and plenty of camels who make it through without having to unload their baggage until they get inside. So is there a small gate in Federal Law (FZ) No. 79, which President Vladimir Putin (image left) signed on May 7, 2013? Here is the official text. Until this law, buying and selling public office, stealing state assets, giving and receiving bribes, were crimes which Russian prosecutors, police and courts enforced only to the extent that they weren’t corrupt themselves. The first innovation of 79-FZ was that instead of attacking the crime at the point of instigation or completion, it went after the proceeds where they were hidden on the other side of the Russian border – in bank accounts and asset holding companies registered in untraceable havens. The second innovation was that the criminal didn’t have to give up his ill-gotten gains, so long as he stayed out of the three branches of government – executive, legislative, judicial – as well the state-appointed managements of state-owned corporations and banks. The third innovation was the creation of a new crime which the weakness of Russian legal concepts of bribery and conflict of interest put out of reach. This isn’t the crime of being on the take, but rather the crime of hiding abroad how much the take is. The first two articles of the law are clear in identifying the officials who must comply, including their spouses and under-age children; and the assets which must be repatriated if the official wants to keep his post. There is no doubt that the fortune which Deputy Prime Minister Igor Shuvalov collected from Alisher Usmanov and Evgeny Shvidler, is covered. He has announced he is repatriating the lot. Suleiman Kerimov (centre), one of two senators representing the republic of Dagestan in the upper house of the Russian parliament, is also covered by the new law. But he has announced he’s keeping his fortune in Switzerland. We’ll come back to that in a moment. Moscow’s lawyers and accountants claim there is ambiguity in the new law’s term “foreign financial instrument”; for example, whether it includes company shares, and whether jewels, bullion, currency, houses, boats, planes and cars are exempt so long as they aren’t stored in banks, or owned by foreign shareholding companies. According to an analysis of the legislation by PriceWaterhouseCoopers (PwC), “unfortunately, the Federal law does not define foreign financial instruments for the purposes of applying this Federal law. It seems likely that, with the application of the Federal law provisions, at least securities of foreign issuers, including shares in foreign companies, may be qualified as foreign financial instruments.” A foreign house, boat, plane and car owned directly and titled in the name of the official or his family looks to be exempt and allowable, though the rules require that the official fully discloses their ownership, and if asked, explain how he came by the money to buy them. On the other hand, if these valuables have been bought by a company in which the official holds shares, then the prohibition applies. Articles 4 to 10 are more or less straightforward in setting out how the officials targeted by the prohibitions must comply, and what powers government enforcers have to compel disclosure. But there is a joke in Article 5. This sets out how the compliance of officials can be checked or investigated. According to Section 3, “information of an anonymous character cannot form the basis for decision-making on the implementation of checks.” In other words, no whistleblowers are allowed, nor spreadsheets and documents which fall off trucks. Unlike the Anglo-American law concept of a trust acting for an individual’s benefit, but incorporated to be legally distinct from the individual and to survive the individual’s death, such trusts are missing from the legal codes of Europe. The Russian Civil Code is not unusual in focusing on the ultimate owner or beneficiary, and ignoring the cutouts. The president of this foundation is Alexander Studhalter; the second and third directors are Philipp Studhalter and Albina Studhalter. The Studhalter family has been engaged in Kerimov’s profit-making businesses for many years in Lucerne, including two of Kerimov’s Swiss-registered asset holdings, SWIRU and Millennium. What the Studhalters have been doing can be followed here. The auditor of the Kerimov Foundation is PriceWaterhouseCoopers. According to the audited financial reports, the foundation had assets of 19 million Swiss francs ($17.7 million) at the end of 2010, but just CHF6 million ($5.6 million) by the end of 2011. In that year Kerimov gave the foundation an income of CHF45.6 million ($42.5 million), and the foundation gave away CHF44.4 million ($41.1 million). Cash at the bank at year’s end was just CHF1.8 million ($1.7 million). Capital of the foundation at the same date was CHF5 million ($4.7 million). The financial report for 2012 has not yet been released, but when it is, it will be obsolete. That is, if Kerimov’s full foreign asset value has been transferred to the foundation, according to Kerimov’s announcement of April 30, 2013. A big if — and one which ought to show up on the foundation books as a new capital item roughly equal to the Forbes estimate of Kerimov’s asset value – $7.1 billion (CHF6.6 billion). Mikhail Prokhorov (image right) is another well-known Russian figure whose foreign assets would come under the disclosure and transfer requirements of the new law if he intends to qualify as Mayor of Moscow, when the city holds its mayoral election in September, and he runs against the current mayor, Sergei Sobyanin. Prokhorov’s move to resume politicking after his abortive campaign for president last year has triggered speculation in the Russian press that he is thinking of putting his assets into a blind trust along the lines of Kerimov’s Swiss scheme. State Duma deputy Irina Yarovaya, head of the Security and Corruption Fighting Committee, and a member of the United Russia faction, has vocally attacked the blind trust scheme for Prokhorov. Her spokesman Oleg Zhdanov said “of course [they are] prohibited. Read the law, it is written there.” Asked whether the law is ambiguous, he responded: “Well, then [refer] to the Central Bank, it is their formulations.” Is Yarovaya equally convinced that Kerimov’s foundation scheme is legal or illegal? Zhdanov replied that Yarovaya isn’t available today to answer. Dmitry Peskov for Putin confirmed receiving the request; his assistant said he would try to answer. At the office of the Department of Press and Information for Prime Minister Dmitry Medvedev, Mikhail Buben is in charge. A week after he confirmed receiving the request, his deputy, Kseniya Kaminskaya, replied: “We ask you to make contact for information on this subject with the press service of the President of the Russian Federation.” After a week the President’s spokesman is still refusing to answer.